Our Bed & Breakfast is uniquely located right beside the sea between two nature reserves (Grimsholmen in the South and Smörkull in the North) and offers various opportunities for nature lovers. In close proximity there are wonderful hiking areas and cycle tracks. 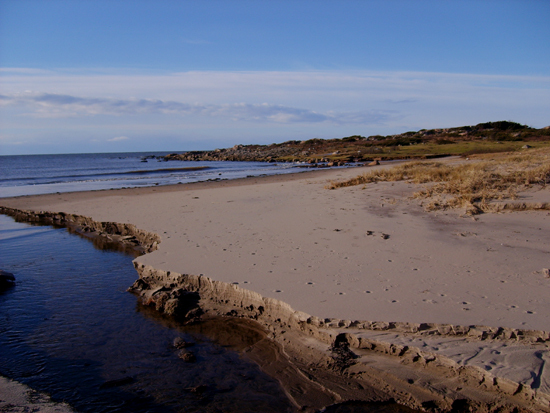 You can discover idyllic small beaches, take a walk along the river Suseån or hike over meadows and cliffs to the water’s edge, where the rocks were created over the course of thousands of years by wind and waves. Find your personal favorite beach for an early morning swim or just relax and enjoy the sea breeze. Grimsholmen is a characteristic coastal area with a rich flora and fauna. There’s a lot to dicover for people interested in nature and animals. The local plants include common meadow-rhue, strawberry clover, bladder campion, crowberry, bird’s foot trefoil, thrift, heath spotted orchid, lousewort, heath and marsh gentian. The cycle trail along the coast of Halland, “Kattegattleden“, and the winding coastal road pass right by our Bed&Breakfast. Remnants of ancient times can be found in graves from the iron and bronze age, e.g. cairns and stone settings. One of the cairns located on the ”Snågakull” contains a stone chamber that is covered by five roof stones. In the bronze ages it was common to bury highstanding people in elevated places. Nowadays you have a magnificent view of the coastline from these hills, from the lighthouse in Morups Tånge in the North to Hallandsåsen in the South. In this area history and myths are woven to legends that have been passed on for generations until today. A myth-enshrouded place of sacrifice located high on a hilltop with an unobstructed view of land and sea stimulates the imagination. Your imagination takes you back in time to the middle ages, when Swedes, Danes and Norwegians fought for supremacy in this region. The local coast offers a lot to explore. Traces of times long gone can be found all around, bearing witness that people have lived here for centuries. On the “Smörkull” (butter-hill) you can find a mythical place of sacrifice where legends about trolls and giants have been told and passed on for many generations. Whenever we have the time, we invite you to accompany us on a walk into the past through the troll-gate and to the top of “Smörkullen”. 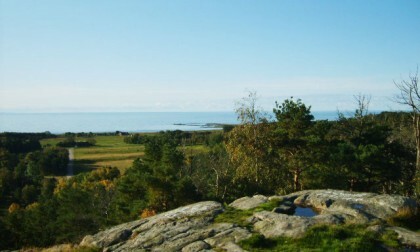 Grimsholmen’s nature reserve is a paradise for both birds and ornithologists. Especially in spring and autumn the area is a known resting place for migratory birds. You may see thousands of eider ducks in the early morning hours of march and april. Even the very rare great crested grebe has been sighted. In the summer you can sit in the front row on sunwarmed cliffs and watch the sparrowhawk and kestrel hunting their prey. During wintertime, snow bunting and twite are looking for food among the seaweed and rarely the sea eagle, gyrfalcon or seabirds like three-toed seagull, petrel or northern garrett can be observed.